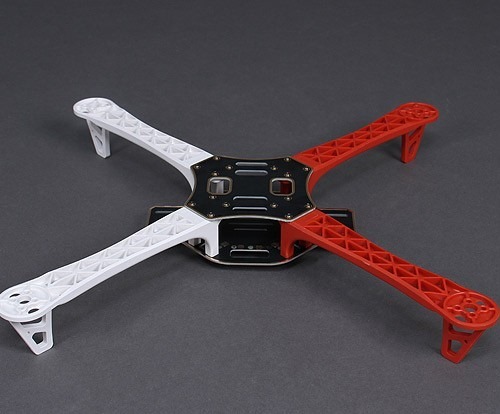 In this series of posts I shall walk you through the basics of building your own Quadcopter. Basically a Quadcopter is a QUAD – ROTOR helicopter that is lifted and propelled by four rotors.A quadcopter is a flying vehicle possessing 4 identical rotors, evenly spaced around the central fuselage (hub). 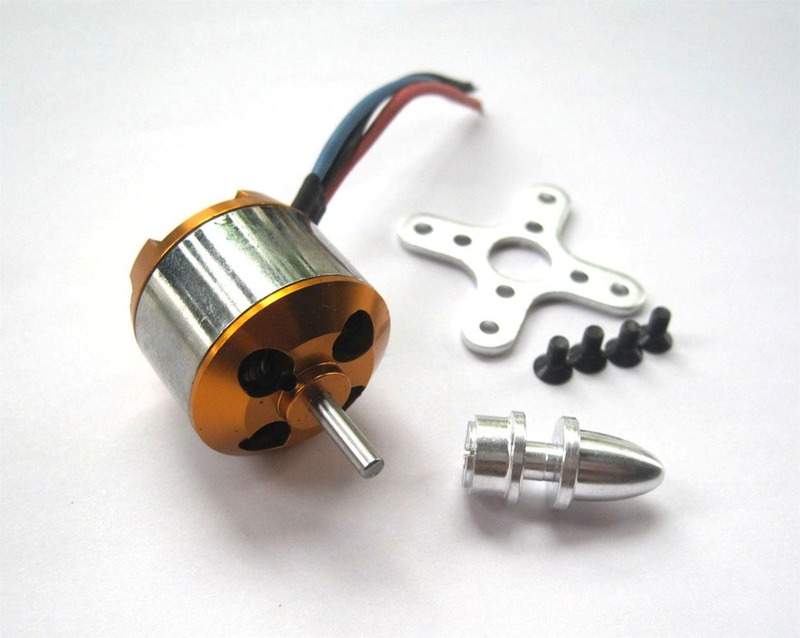 Brushless DC motors are used as rotors & they use symmetrically pitched propellers. Control of vehicle motion is achieved by altering the pitch and rotation rate of one or more motors, thereby changing its torque load and thrust/lift characteristics. Various movements are possible by varying the direction of rotation of propellers & by altering the speed of the motors. Let us see what all things you need to build the copter. This is the most important basic part of a Quadcopter.As the name indicates , the copter has 4 arms.The frame should be light as well as rigid to host a LIPO battery , 4 BLDC motors ,4 ESC & controller. You can build your own frame using Aluminium or wood channels.But I suggest you to go for a readymade one like F450 FRAME which is easy to assemble. 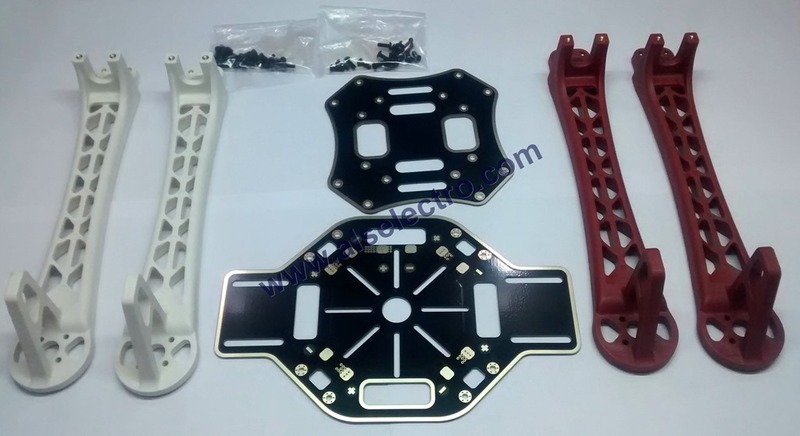 The frame arms are made of ultra strength material to survive any crash.The frame boards are high strength compound PCB frames, which makes wiring of ESCs and battery more safe and easier.To make your flight colorful the frame arms come with different colors. Better speed vs torque characteristics, High efficiency with Noiseless operation & very high speed range with longer life. You need an Electronic Speed Controller control the motor.As there are no brushes to wear out the life of BLDC motor is much longer.There is no sparking and much less electrical noise. The only disadvantage of a brushless motor is its higher initial cost. You need four nos. of BLDC Motors for the copter. Generally BLDC motors are referred in KVs like , 850 KV , 1100 KV,1400KV ,1800KV ,.. 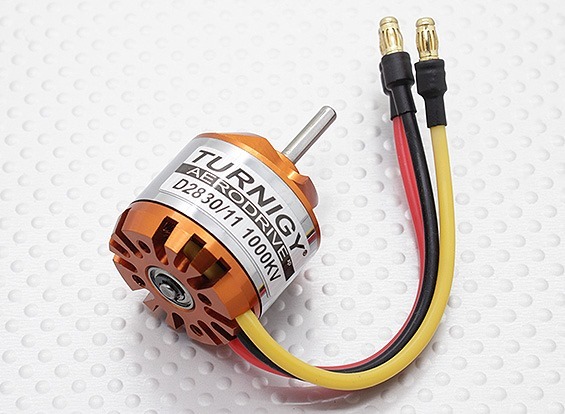 Many people new to flight get confused by brushless electric motor ratings, specifically the Kv rating thinking Kv = kilo-volts (1 kV = 1000 volts). This is not the case at all. The Kv rating of a brushless motor refers to how many RPM it turns per volt. The KV rating on a BLDC motor is equal to RPM per VOLT applied to the motor . So a BLDC motor with a KV rating of 1000 KV will spin at 1000 RPM when 1 volt is applied ,if you apply 12 volts the motor will spin at 12000 rpm . With a 1.5 kg quad & 0.5kg payload, i.e., 2kg All-Up-Weight, you will need 2kg of thrust to defeat gravity; that’s 500g (2kg divided by 4) thrust per motor. You’ll need at least double the total weight (here it is 4 kg) of maximum thrust; div by four is 1000g thrust per motor at max throttle. Price range of BLDC motors – Rs.900 to Rs.1400/- each. The ESC as used in radio controlled craft performs two primary functions. The first is to act as a Battery Elimination Circuit (BEC) allowing both the motors and the receiver to be powered by a single battery. The second (and primary) function is to take the receiver’s and/or flight controller’s signals and apply the right current to the motors. Each BLDC motor need an ESC .ESC Regulates power to the motor according to the input throttle level. 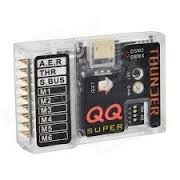 It also provides +5V power for the flight electronics.ESC is built on 32 bit Microcontroller (ARM/AVR) & has an array of MosFets to drive BLDC motor.The Firmware of ESC is factory programmed. If you cut open the sleeve of ESC you can see the Processor & array of MOSFETs. As the brushless motors are multi-phased, normally 3 phases, you can’t just apply power to it to make it spin. The motors require some special phase-control electronics that is capable of generating three high frequency signals with different but controllable phases, but the electronics should also be able to source a lot of current as the motors can be very “power-hungry”. 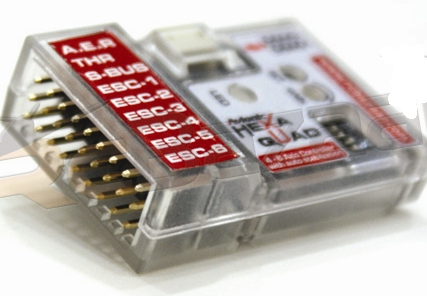 ESCs do the perfect job of controlling BLDCs.. The ESCs is simply a brushless motor controller board with battery input and a three phase output for the motors. For the control it is usually just a simple PPM signal (similar to PWM) that ranges from 1ms (min speed=turn off) to 2ms (max speed) in pulse width. The frequency of the signals does also vary a lot from controller to controller, but for a QuadCopter it is recommended to get a controller that supports at least 200Hz or even better 300Hz PPM signal, as it should be possible to change the motor speeds very quickly to adjust the QuadCopter to the stable position. ESCs can be found in many different variants, where the source current is the most important factor. You should always choose an ESC with about 20A or more in sourcing current as what your motor will require. Computer-programmable speed controls generally have user-specified options which allow setting low voltage cut-off limits, timing, acceleration, braking and direction of rotation. Reversing the motor’s direction may also be accomplished by switching any two of the three leads from the ESC to the motor. Price ranges from Rs.750/- to Rs.1200/- according to the current rating. 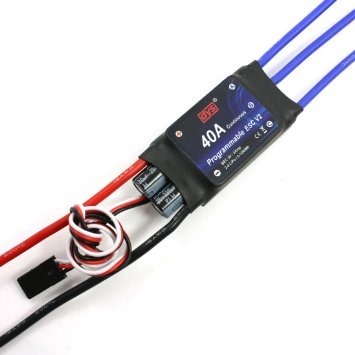 Lithium Polymer –LIPO are a type of rechargeable battery that has taken the electric RC world by storm, especially for Quadcopters. They are the main reason electric flight is now a very viable option over fuel powered models. LiPo batteries are light in weight & hold huge power in a small package.They have high discharge rates to meet the need of powering quadcopters. Remember LiPo batteries are much expensive & have life time of only 300 to 400 charge cycles. Special care to be taken to Charge , discharge or store the LiPos.Because of the volatile electrolyte used in LiPo’s they can burst or catch fire easily when mishandled. Unlike conventional NiCad battery cells that have a voltage of 1.2 volts per cell, LiPo battery cells are rated at 3.7 volts per cell.So you get in multiples of 3.7v like 7.4 & 11.1v batteries. Capacity indicates how much power the battery pack can hold and is indicated in milliamp hours (mAh). 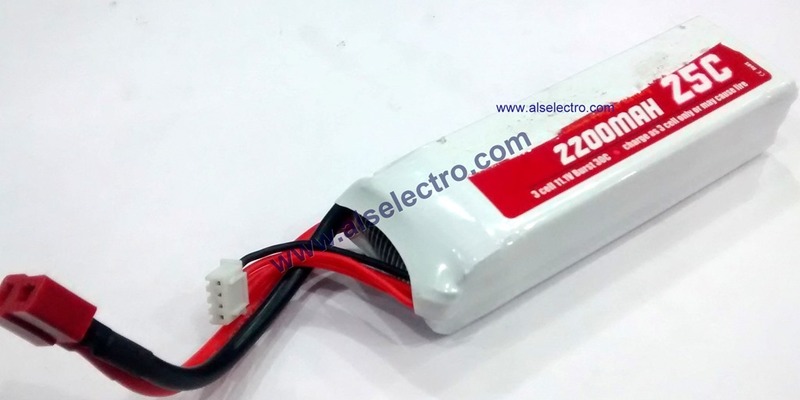 A 2200maH would be completely discharged in one hour with a 2200 milliamp load placed on it. If this same battery had a 1100 milliamp load placed on it, it would take 2 hours to drain down. If you want to increase your flight time use more capacity battery like 3000maH. LiPo batteries can be found in packs of everything from a single cell (3.7V) to over 10 cells (37V). The cells are usually connected in series, making the voltage higher but giving the same amount of amp-hours. For e.g take a battery of capacity 4000maH, wIth a discharge rate of 20C mentioned. . With this battery you will be able to source a maximum of 20Cx4000mAh = 80A. So in this case you should make sure that the total amount of current drawn by your motors (ESCs) won’t exceed 80A. Discharge rate is simply how fast a battery can be discharged safely. In the RC LiPo battery world it is called the “C” rating.Remember you should never discharge a LipO BATTERY BELOW 80% OF ITS CAPACITY. Do not charge a LipO Battery with a normal charger meant for NICAD . 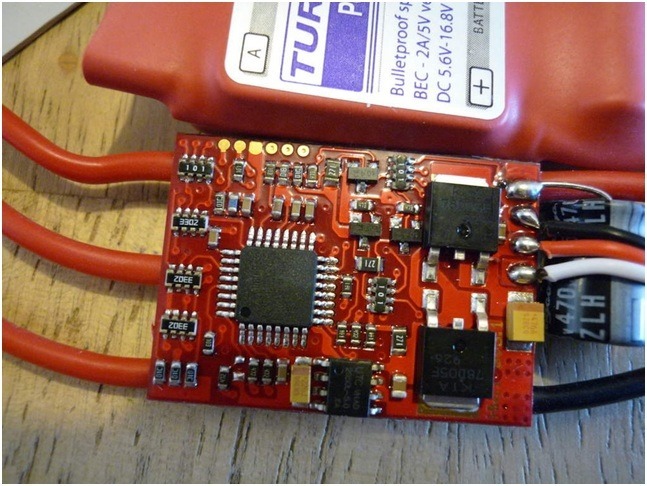 A 11.1 volt RC LiPo battery cell is 100% charged when it reaches 12.6 volts. Charging it past that will ruin the battery cell and possibly cause it to catch fire. So never leave a Lipo battery charging unattended.If you have a 2 cell (2S) pack you must select 7.4 volts or 2 cells on your charger. If you selected 11.1V (a 3S pack) by mistake and tried to charge your 2S pack, the pack will be destroyed and most likely catch fire. Charge temperature–must not be charged when temperature is lower than 0° C or above 45° C.
Discharge current protection to prevent damage due to short circuits. Charge voltage–a permanent fuse opens if too much voltage is applied to the battery terminals . Overcharge protection–stops charge when voltage per cell rises above 4.30 volts. 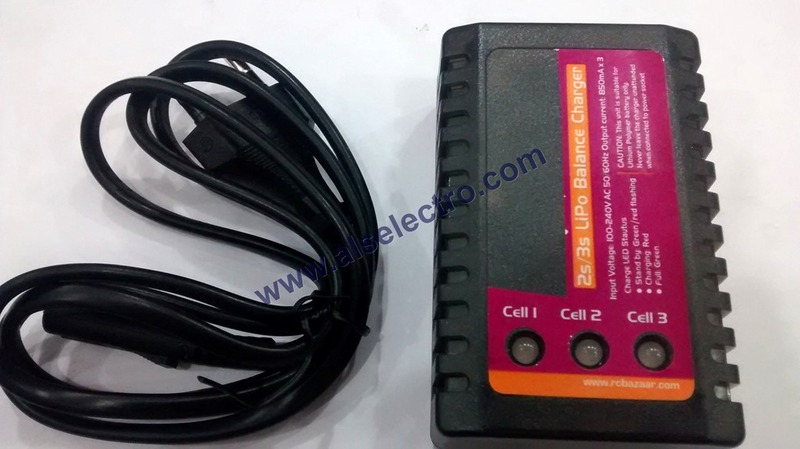 Over discharge protection–stops discharge when battery voltage falls below 2.3 volts per cell . Always place the battery on a concrete floor while charging & do not leave it unattended.LiPo batteries are always safe to use when you follow the rules of handling. 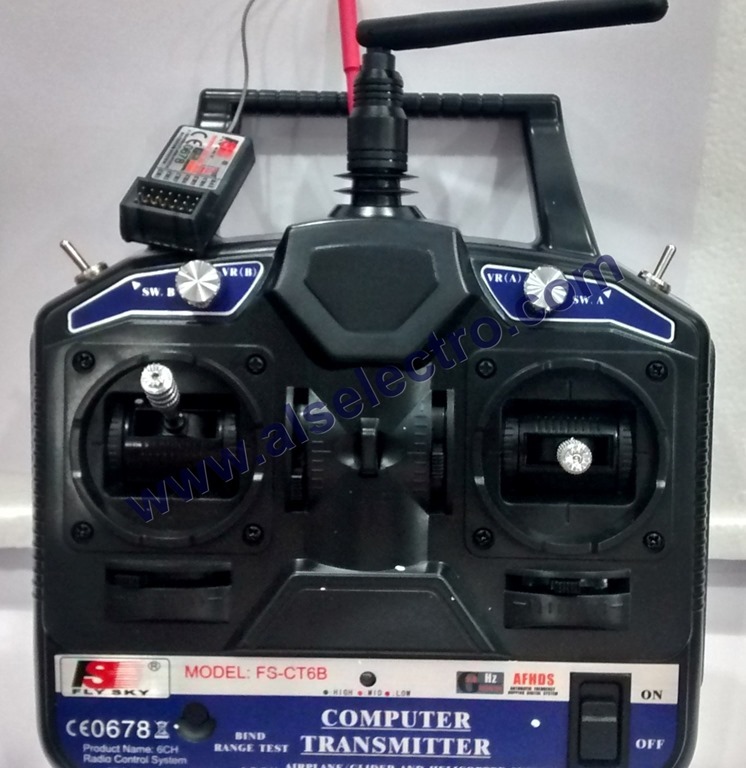 You need a RC Transmitter (2.4 GHz RC radio transmitter ) to direct the quadcopter’s direction and position . A 2.4 GHz RC radio receiver on the quadcopter receives commands from the RC transmitter on the ground. (One way link) . You get a Receiver along with the corresponding Transmitter . The transmitter is the hand-held controller you use to remotely control your craft. The transmitters have two sticks, two trim buttons or a slider per stick, a number of switches, a display, and a power button. Transmitters and receivers need a frequency range to operate and the new frequency range is 2.4 GHz, with digital spectrum modulation.2.4GHZ is the ISM (Industrial,Scientific & Medical) Radio band which needs no license to operate. When you read the manual of a Transmitter ,you come across the terms “ set to Mode 1 “, Mode2,3 ,etc.. This refers to the Default Configuration of the Sticks on the Transmitter. Most widely used is the MODE 2 which means the Left stick controls THROTTLE & RUDDER & the Right stick controls ELEVATOR & AILERONS. A transmitter is described primarily by the number of channels it supports. The one shown above in fig. is a 6 channel one. Generally speaking, each function of an airplane requires one channel. For example, a typical 4 channel airplane will have throttle, ailerons, elevator, and rudder control. So in RC terms the channel referred is the FUNCTION CHANNEL & NOT THE FREQUENCY CHANNEL. Channels being the mechanism for communicating commands. One channel is typically used to communicate one attribute. Information about the throttle or up/down position of your left stick requires one channel. Similarly the rudder or right / left position of your left stick requires one channel. Having left and right sticks therefore requires 4 channels. The receiver is the generally small match box size device to which the Transmitter sends its commands. The receiver gets its power from the main battery.Always use the Receiver that comes with the Transmitter box. The one you see in the picture above is an LCD model which allows you to program the radio at the field and no more to carry laptop to the field to change any setting. • 2.4 GHz FHSS technology provides a highly secure connection, optimum responsiveness, increased range and the ability to fly more safely. • Digital trims on the 4 main channels. • 8 model memories with model naming on 4 characters. • Adjustable TX power to suit your range of flying. • Foldable handle and antenna. 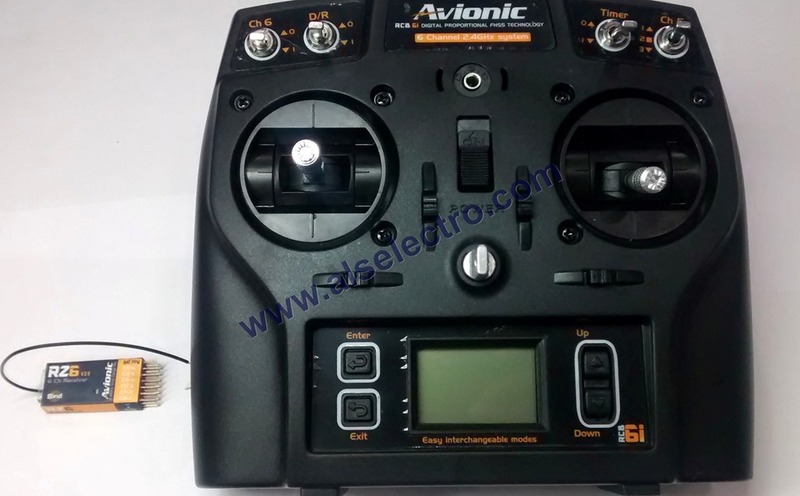 • Digital programmable transmitter with 6-channel able to effectively control model airplanes or gliders. • Trainer / Simulator connector available on the top front of the transmitter. • Short antenna retractable for easy storage of the device during transport. • LCD to enable reading of your settings in any surroundings. • 4 programming buttons allow quick and easy access to all features. • DualRate feature individually adjustable for each of the 3 control axes. • Reversing feature for each of the 6 channels. • Pairing functionality with Rx. • Unique range test feature. The most common Control board widely used is KK control board.Many versions are available. The models available are KK2.0 , KK2.1.5 & KK2.1 HC. The first 2 models have on board LCD.This may break when the copter crashes( for a beginner).To avoid this the third model was introduced where the LCD unit is remotely connected. 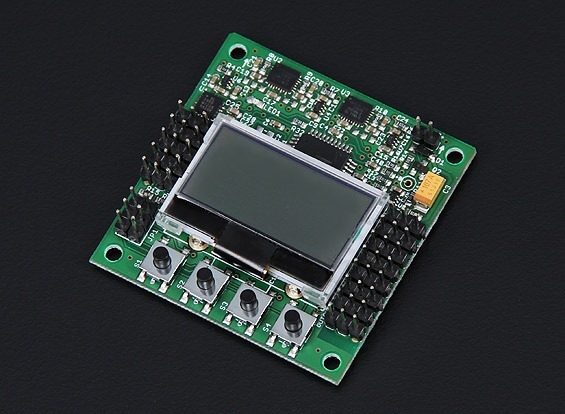 The KK board has built in Gyros,accelerometers & a Microcontroller to control the ESCs. The LCD screen and built in software makes install and setup easier than ever. A host of multi-rotor craft types are pre-installed. simply select your craft type, check motor layout/propeller direction, calibrate your ESCs and radio and you’re ready to go! all of which is done with easy to follow on screen prompts! 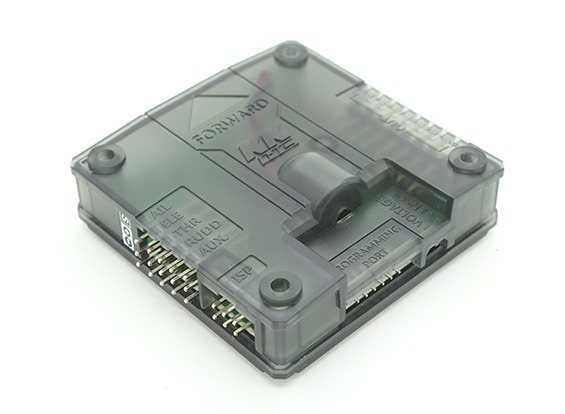 The original KK gyro system has been updated to an incredibly sensitive dual chip 3 Axis gyro and single chip 3 axis accelerometer system making this the most stable KK board ever and allowing for the addition of an Auto-level function. At the heart of the KK2.0 is an Atmel Mega324PA 8-bit AVR RISC-based microcontroller with 32k of memory. An additional 2 motor output channels have been added to the KK2.0 allowing for a total of 8 motors to be controlled . A handy Piezo buzzer is also included with the board for audio warning when activating and deactivating the board. The version KK2.1.5 has upgraded gyro system ( 6050 MPU system ) making this the most stable KK board ever and allowing for the addition of an auto-level function. At the heart of the KK2.1.5 is an Atmel Mega644PA 8-bit AVR RISC-based microcontroller with 64k of memory. An additional polarity protected header has been added for voltage detection, so no need for on-board soldering. A handy piezo buzzer is also included for audio warning when activating and deactivating the board. The KK2.1.5 added polarity protection to the voltage sense header and a fuse protected buzzer outputs, in case something is accidentally plugged in incorrectly. The KK2.1HC (Hard Case) is new with updated sensors, memory, header pins, hard case and remote programmer.To avoid damage to the LCD screen,it is designed to connect remotely. The KK2.1HC is the next big evolution of the first generation KK flight control boards. The remote LCD screen and built in software makes installing and setup easier than ever. The screen and programing buttons have been relocated to a remote plug-in programmer and a hard case installed, this makes the KK extremely durable. The plug in programmer uses the exact same format as the onboard version and can be plugged in at anytime for a quick value change. This new design allows the KK to be installed in frames where access to the onboard buttons and screen was an issue, you can even leave the cable plugged into the KK side and run it out for access to the programmer. The Hard case still retains the standardized 45mm mounting holes and has the buzzer is now internally mounted. Mounting locations and damage to the LCD screen is a thing of the past. Apart from the KK controller board we’ve Hexa Quad Flight controller boards in the market. You can either use a KK board or Hexa Quad as a Flight controller. Avionic Hexa Quad controller . It has a built in 3 axis gyroscope and 3 axis acceleration sensor with self stabilising function which gives it a super stable flight performance. It supports all general receivers. Receiver type and multi-rotor type are very easily selected via the small DIP switches and calibration is also extremely easy with the set button. Once calibrated sensitivity is also a very simple affair with just one small adjuster on the front of the unit making this flight controller one of the easiest to set up ever. The unit is supplied with 4 x male to male connectors and 2 x double sided mounting tape and a small screwdriver for making adjustments. Suitable for multi-rotors with up to 6 motors and supports 4 configuration types. On each of the brushless motors there are mounted a propeller. The 4 propellers are actually not identical. If you have a look at the picture above you will notice that the front and the back propellers are tilted to the right, while the left and right propellers are tilted to the left. This reason for this is that the motor torque of and the law of physics will make the QuadCopter spin around itself if all the propellers were rotating the same way, without any chance of stabilizing it. By making the propeller pairs spin in each direction, but also having opposite tilting, all of them will provide lifting thrust without spinning in the same direction. This makes it possible for the QuadCopter to stabilize the yaw rotation, which is the rotation around itself. 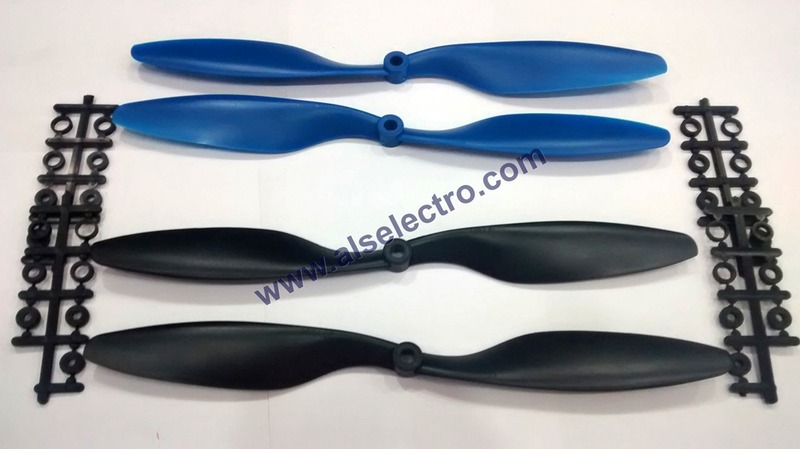 When using high RPM motors you should go for the smaller or mid-sized propellers . Larger propellers give more thrust per revolution from the motor.